Although displaying in your blog in search engines is important to bring more visitors, we can hide Blogger blogs from search engines and remove our blog from blogger listings very easily through Blogger.com settings. This is useful if you are running a personal blog and do not want to become it "Private" through Blogger settings. First Go to "Settings"  "Basic" of your blog. Click "Edit" link of your privacy settings. There are two settings under privacy settings with "Yes" and "No" options. 1. Add your blog to our listings? A Listed blog may be linked to from Blogger.com, such as the Blogger home page and Next Blog. If you select "No" your blog will not appear in these places, but it will still be available on the Internet. This blog will still be displayed on your profile unless you hide it. 2. Let search engines find your blog? 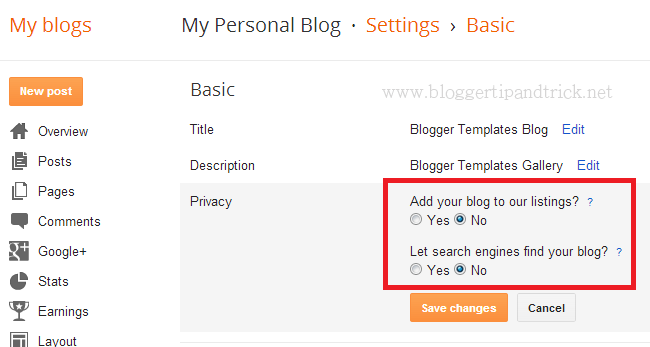 If you select "Yes" blogger will include your blog in Google Blog Search and ping Weblogs.com. If you select "No", everyone can still view your blog but search engines will be instructed not to crawl it. If there are links to your blog from other websites, search engines may still suggest your blog in response to queries. Check "No" radio buttons for both above settings and click "Save changes". You have successfully hide your blog from search engines in blogger listings.